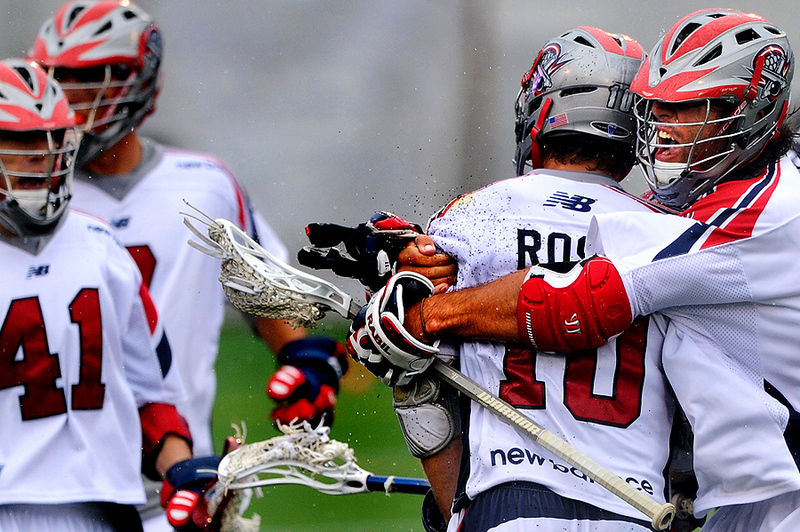 "Paul Rabil #99 of the Boston Cannons celebrates with teammate Brad Ross #10 after a goal in the second quarter against the Chesapeake Bayhawks in the Major League Lacrosse semi-final at Navy-Marine Corps Memorial Stadium on August 27, 2011 in Annapolis, Maryland. The Cannons won, and would go on to win their first MLL title." Spent a couple hours in a complete downpour (read: a Hurricane Irene) shooting my favorite past-time: Lacrosse. I grew up playing the sport in Maryland and always have had some sort of connection to the game. Simply search it here on my blog and you'll find a ton of images and stories. However, I've never gotten the chance to shoot the Major League Lacrosse. Luckily, I got the call to shoot not one game, but two semi-final games in Annapolis. The fun part of the weekend, minus the sideways rain, was that some of the players I played with growing up and others I photographed in college where gunning for the championship. That would include, according to my shot list - "THE most popular player in the world" - Paul Rabil. I wouldn't go that far, then again, I should agree. He has more Facebook fan pages than, umm, who knows. The guy is simply popular and very talented.